Lightweight, affordable, quality-built travel trailers, fifth wheels and campers. Whether you plan on purchasing a fleet of vehicles or need a lease, let us help you meet your commercial needs. We can deliver your new vehicle today. SEE OUR GREAT SELECTION OF NEW & USED RVS www.smprv.ca Located on Highway 16, Houston, BC • Phone 250-845-2244 • Toll Free 1-800-665-3151 NORTHWEST’S LARGEST VOLUME DEALER FOR A REASON!! LNG Canada is in the best position possible to begin construction should the project move ahead,” he said. Maeseele points out that the contractors were hired from the local area. They have all been going through the company’s rigorous safety training and site orientation program. “The activities we do now are utilizing local contractors and local people. Our goal, whenever possible, is to ensure the economic benefits from this work remain in the local area.” While there are about 100 people expected to do work on the site throughout this holiday season, Maeseele said the work might increase to 250 or 300 through to the time when the company may make an FID on whether the project will proceed into the construction phase. Yet whether employing 10 people or 100 people, Maeseele emphasizes the need for safety when it comes to any work that happens for LNG Canada. 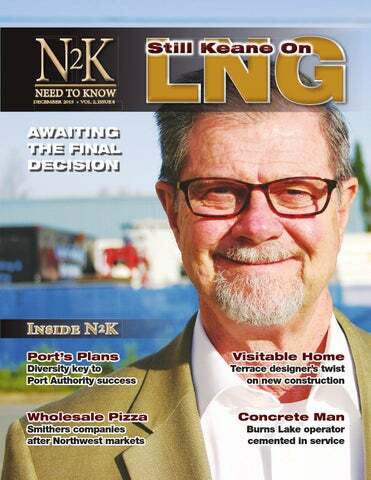 he head of the BC LNG Alliance is pressing on with their public awareness campaign that LNG in Northwest B.C. is still very much alive. President David Keane was joined by the group’s Director of Communications Jas Johal, to tour Northwest communities and drive home the point that proposed LNG projects are still moving along. “I think people get concerned when they don’t see projects moving quickly to final investment decisions. I think we have to remember these are highly-complex projects with a lot of moving parts that have to come together at the same time in order for a company to declare final investment decision,” Keane said. He added that the projects don’t follow political timelines too, responding to a question about the sort of pressure that may come with a provincial government very keen on seeing the industry develop. Keane continues that the pace of work isn’t surprising to him. “I don’t think it’s going any slower than it was expected,” he said, noting there are challenges in trying to make projects economically competitive on a global scale. We’ve heard from local women that equal access to opportunities and gender equity is important - we think it is too. Local women have also told us that they want to have an equal say in conversations that impact their family and community. As a result, we created the Professional Women’s Network. challenges that we face as women and as individuals, and even for me as First Nations…I think it’s really important for us to work together to the places that we want to be. BG Canada is proposing an LNG facility on Ridley Island near Prince Rupert, BC. Stay informed about what we’re doing in the community by signing up for our email updates using the form on our Contact Us page. We’ve recently updated our website so we encourage you to take a look around and explore the new content! Visit www.princerupertlng.ca. PRETIVM IS ADVANCING ITS HIGH-GRADE GOLD BRUCEJACK PROJECT IN NORTHERN BC. By Flavio Nienow Although ready-mix concrete supply is the company’s most profitable service, offering a wide range of services has been vital to keep a steady cash flow, according to Sensenig. “We can have a couple of good years when we could possibly survive just doing concrete, but there are years when there is very little concrete and we need the excavating and gravel projects to survive,” he said. “We need to do more than one thing in this area.” The wide range of services includes concrete pumping, excavating, snow plowing and sanding, log hauling, as well as sand and gravel supply. Although clients are mainly located in the Lakes District, the company also works with contractors coming from other areas for industrial and commercial projects. The Concrete Man has worked on projects at Huckleberry Mine, Eskay Creek Mine, Kemess Mine, Endako Mine and Rio Tinto. Over the last few years the company has also supplied concrete and gravel for the new Lakes District Hospital and Health Centre and for the rebuild project of Babine Forest Products. Sensenig started the company in 1999, initially forming and finishing concrete floors. In 2005, The Concrete Man bought a concrete plant in Burns Lake. Although the company currently has seven members on the team, they have had part-time help over the years when the company undertakes bigger projects. When The Concrete Man worked at the expansion of Endako Mine in 2012, for example, they had up to 12 workers at the height of the project. here was excitement in the Morsund family as they watched a man with a clipboard leave their new pizza-making space in Smithers in November. The building inspector had just approved the family’s renovations to a Fourth Avenue building, which is adjacent to their restaurant: Chatters Pizzeria and Bistro. The inspector’s permit made it one down, one to go for the new building, which just needed a health permit before opening its doors. When co-owners Chris Morsund and his mother Leslee received their final tick of approval, the space would be used to prepare some 1,300 pizzas per week. A mammoth, custom-made cooler had been installed to store the pies before they were transported to stores and Overwaitea Foods supermarkets between Prince Rupert and Prince George. To cope with the workload, the owners were also increasing their staff from 14 to 24. Chatters was just a restaurant when the Morsund’s bought it eight years earlier, but Chris started selling packaged pizzas to make them accessible to people in other communities. but it is very hard to make retail here in Telkwa,” he said. Overwaitea Foods media spokesperson Julie Dickson said her company sought out products that customers were asking for in their communities. “Often that will then grow beyond a single store offering and it can be expanded to the region and sometimes to the whole chain but it often starts small and grows from there,” she said. Dickson said she believes public interest in local and artisan foods started to increase about ten years ago. Paul’s Bakery owner Sheona Sikkes approached Bulkley Valley Wholesale, which is owned by Overwaitea Foods, to see if they were interested in stocking her business’s famous cinnamon bread. In addition to stocking it locally, Overwaitea started shipping the product to Prince George, Kitimat and Terrace. Sikkes believes the supermarket’s increased interest in local products was driven by the public. “I think people are more interested in knowing where their stuff is coming from and people are getting more knowledgable which is brilliant,” she said. Our team specializes in sustainable site, building & interior design, heritage restoration & project management. “Research has shown this added cost to a new $400K [house] ... no more than $2K.” - David Block units added to the Tuck Ave. Seniors Housing complex last year. But the amount of private housing of the same kind is small. City of Terrace development services director David Block says there are examples of renovations such as adding ramps to provide access at homes with stairs. He notes however that such renovations are costly and often result in a less than attractive dwelling. The building standard with attributes such as those of the Bal duplex even has a name – visitable, says Block. “The costs to construct new dwellings, detached or multi, to visitable housing standards at time of new construction is usually a very nominal, if any, increase. Research has shown this added cost to a new $400,000 single family dwelling would be no more than $2,000,” he said. Both Block and Bal point out that many of the attributes of this kind of housing – no stairs, for example – would appeal to people of all ages and abilities. A visitable house is an investment as well as a purchase when considering the possibility of a later resale, said Bal. For more information on Praxair products, services and locations please call 1-800-225-8247.
helped out,” Hughes said. Hiebert couldn’t agree more. “When you get the community, as well as companies and corporations involved, it benefits everyone.” The society deals directly with suppliers such as Bell and Shaw. “It’s ideal because we can bypass the middle people and they really do try to help and cater to our needs,” Birdie said. For the society, it’s always about finding new ways to benefit the community. Along with various radio stations, people can access free Wi-Fi service in various locations in town. “Even people camping at Stuart Lake were amazed that they could camp, have Wi-Fi and television in such a beautiful location,” Birdi said. With 31 television channels, the society is hoping to add two more high definition channels by the end of the year. “With the services we are currently providing, we are the largest T.V. and radio society in the country. Our business model has attracted many other communities who are looking into implementing a system like ours,” Birdi said. But the society’s 12-member committee seems to have fewer meetings today. It is keeping busy by responding to requests from the community. “Tell us what you need and it gets done. We have willing volunteers. It always gets done,” Hiebert said. cars are connected to live steam to loosen it again allowing it to be poured out. “It could go by pipe too, but rail, in many ways, is simpler.” As for the overall game plan for the refinery, he says he had some questions regarding the site to work out before he could submit his environmental description with the government, but said that description, the first step in an environmental review, would go in before Christmas. It’s a two-year process to get permits, and he said he’ll be seeking financing during that time too. Once financing and the review is done he said it will take up to six years to construct the facility. At those estimates the refinery could potentially be running by 2023.
anfor’s planning and forestry activities received passing grades following an audit by Forest Practices Board. Canfor, which conducted the practices on behalf of Smithers forest licencee Lowell A. Johnson, were found to be in compliance by the independent forestry watchdog. “We are pleased to see that this licensee carried out good forest practices and fully met the requirements of the Forest and Range Practices Act and the Wildfire Act,” said Tim Ryan, board chair. Auditors examined operational planning, timber harvesting, road construction, deactivation and maintenance, silviculture and fire protection activities carried out between Oct. 1, 2013, and Oct. 9, 2015. The operations were located south of Chapman Lake, about 35 kilometres east of Smithers. The Forest Practices Board reports its findings and recommendations directly to the public and government. Lands admInIstrator The First Nations Framework for Land Management allows First Nations to opt out of land related sections of the Indian Act thereby enabling us to manage our reserve lands under an overarching Haisla Land Code. The Haisla Land Code was ratified by the community last year. We are seeking someone who is qualified as a Lands Administrator or is likely to be qualified for the role by April 1, 2016. Full details can be found on: http://www.haisla.ca/council/job-opportunities/ Interested applicants should submit a cover letter and resume along with three references to: Stephanie McClure, Human Resources Manager Haisla Nation Council We thank all applicants for Haisla PO Box 1101, Kitamaat Village, BC, V0T 2B0 their interest, however, only Fax (250) 632-2840 those short-listed will be Email: humanresources@haisla.ca contacted. Pacific NorthWest LNG will create new local jobs that will give young people and future generations more opportunities to stay in northwest BC. Will your project emphasize hiring local workers? Yes. We’re committed to hiring as many local workers as possible for construction and operation jobs at our facility. The investigative work we’re currently conducting around Lelu Island is already providing local jobs. Are you providing training before construction starts? Yes. We have already helped over 100 local people receive training through our Individual Training Sponsorship Program. We have also invested in numerous skills and education initiatives including Coastal Pathways, Adventures in Industry and the 150 Ton Master Mariner Program. Will I have to be a skilled tradesperson to get a job? No. A wide range of positions will be available through construction and operations. Here are just a few examples. For more information, visit one of our community offices in Port Edward or Prince Rupert, PacificNorthWestLNG.com or call 250.622.2727. Trade is building stronger communities. The Port of Prince Rupert is growing opportunities and prosperity by connecting the communities of northern BC. Last year, port activity was directly responsible for the equivalent of 3,060 permanent full-time jobs. 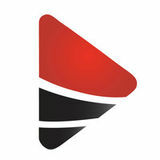 Watch and share our video tribute to the workers and families of BCâ&#x20AC;&#x2122;s gateway industry: youtube.com/rupertport.